As promised, I've finally found time to post about the progress on my Apogee prototype. I'm very happy with the progress so far and things are coming along nicely. I've been writing the pattern as I knit (or I'll never remember the details) and I can see from this very rough draft that I've got a lot of math ahead of me, and I'm definitely going to need testers (both tall and average height). And it's going to be the little details that either make or break me. 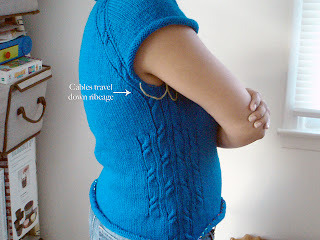 For example, I loved the idea of using cables to create the waist shaping because it kept the pattern more simple and allowed the knitter to customize how much it pulled in by simply adding more cables, or taking cables away. No fussing about where the decreases should start and how far they should go before increasing again. In my experience with sweater knitting, I always need to start the decreases about six inches from the underarm, but most patterns suggest starting before that (because they aren't as tall as I am). On the other side of that coin, I always have to stop the decreases before they suggest and start working back out because even though I'm tall, I'm very short-waisted. I only know all of this from many sweater experiments and finally getting one right. So this method takes care of that and makes this a more simple knit...until you hit the ribbed hem, that is (but more on that in a minute). 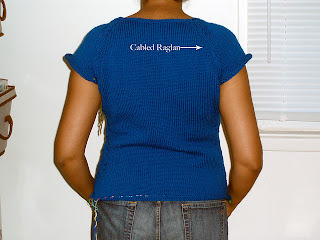 The OCD in me insisted on symmetry where ever possible, so that meant that the cables needed to appear to flow from the shoulder and down the body. I didn't want all of the cables to appear out of no where and float in the middle of the sweater. That took some serious doing to get it set up correctly, but once that was finished, it worked out just as I'd hoped and the alternating cables over the ribs kept things interesting enough to make the body work up very fast. In fact, I averaged about a skein per night! 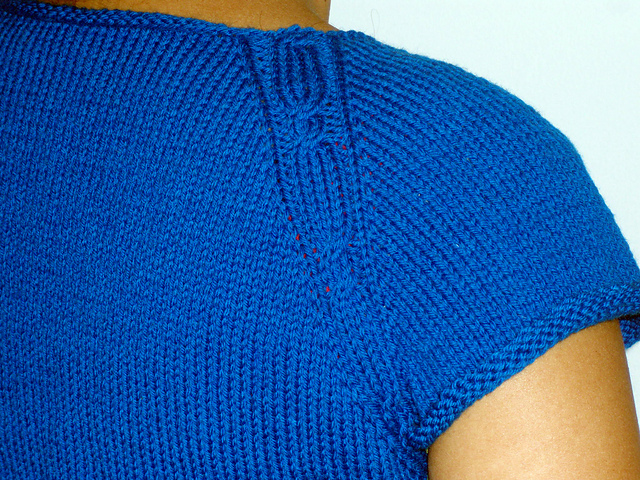 Once I reached my intended length, I started working on the ribbed hem. Here's where things get complicated. 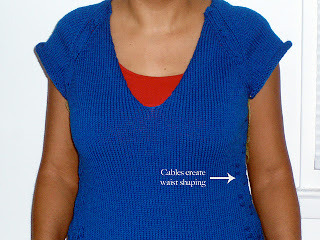 As you can see from this shot, the center cables extend all the way down the body and I wanted them to flow into the ribbing too. That was harder than it sounded at first. I couldn't seem to get the numbers to line up so that the center K2 column would continue down both sides (on the other side it became a P2) and when I finally decided that it didn't need to be that detailed, and that maybe I was the only one who really cared about that, I got to the end of the round and saw that it started and ended with a K2. That's not good. I needed to decrease two stitches so it would line up correctly. So I decided to continue the cable-ribbing all the way down the hem, and to work a 2x2 ribbing over the front and back sts between them. I needed to decrease the 2 sts from the front of the sweater to make that work and I think that has to do with where I started the neck shaping on the prototype...so I'm not sure if it will be necessary to do this in the actual pattern. This is where the editor and the testers will be necessary. 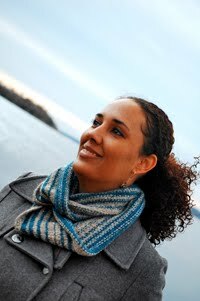 Anyway, the reason you don't see the hem in any of these photos is that I haven't actually knit it yet. 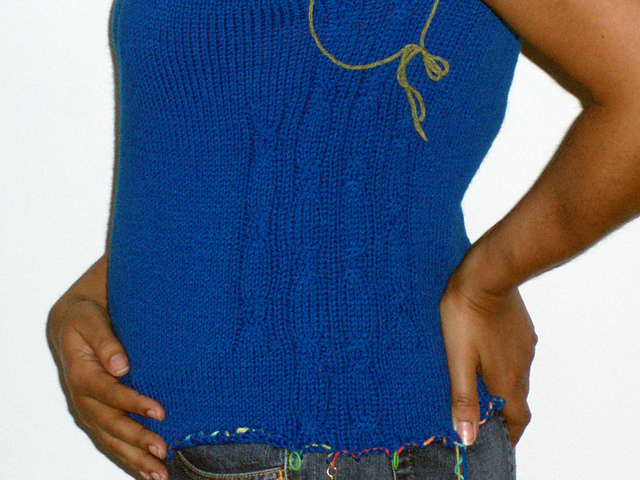 I worked two rows and then put the body on a holder to start the sleeves. This is unusual, but I decided that I needed to know how many yards were used in knitting the average length sweater (in order to calculate yardage for the other sizes) and the best way to do that, other than knitting two sweaters, was to stop knitting mine when I'd reached the finished length of the average 38" an work the sleeves until they are also the correct length of the average 38", and I'd get my numbers. Then I'll go back and finish off my tall 38", and I'll know the difference between the tall and average yardages (in theory). 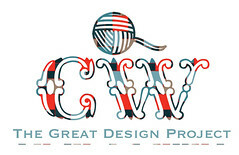 I have a very large swatch, and I'll have yardage for one size (in two different lengths), and I have an excellent reference book that discusses how to calculate yardage for a design...so once I finish and I've had some sleep (still working on that whole balance thing), I'll take a stab at it.